Each year a group of former and current Magic Pros—including a couple of Pro Tour Hall of Famers in Jon Finkel and Bob Maher—give something back to the game they love. They, along with President Timothy McKenna, Eric Berger, Chris Pikula, and Matt Wang preside over Gamers Helping Gamers, a charity that grants college scholarships to Magic players every year. It is my pleasure to introduce the two winners of this year's scholarships. Each winner is granted a four-year scholarship to the tune of $5,000 per year each. While you might expect that a panel of Hall of Famers, Pro Tour Top 8 competitors, and Grand Prix Champions might have a very Spike-y bias, the winners have been drawn from a broad cross-section of the player base. The two winners this year described themselves as "a competitive player" and "a casual player" in my interviews with them. Lirek Kulik is a 20-year old competitive player from Poland, by way of Brooklyn, NY. Kulik has lived in the United States since he was nine years old, but his love of card games was already two years old having started with a popular children's CCG when he was seven. When he moved to Brooklyn, he began playing the next hot game as a way to assimilate with the other kids at his school. Lirek Kulik, one of this year's Gamers Helping Gamers scholarship winners. "I started played in a pretty competitive atmosphere in a store in NYC called Neutral Ground. I went to regional tournaments and I enjoyed the competitive scene until I got to high school," recalled Kulik, who would not find Magic until High School. "I took a bit of a break freshman and sophomore years from card games, but the summer before junior year I found Twenty Sided Store and fell in love. I was instantly hooked on Magic and I loved its complexity. I always found it a challenge to be able to navigate a game to a winning position. I started watching Pro players draft and play Constructed in my spare time…and the rest is history." Given the means to do so, Kulik would dive fully into the Eternal formats; drawn to the complexity, power level, and need for critical decision making. "Do you force the turn-one Delver? Do you go for the Oath now or wait until you have a Flusterstorm or another counter to protect it? I enjoy those formats, mostly because the blue decks are prevalent. And to be able to win with those decks requires a lot of thinking," he gushed about Legacy and Vintage. 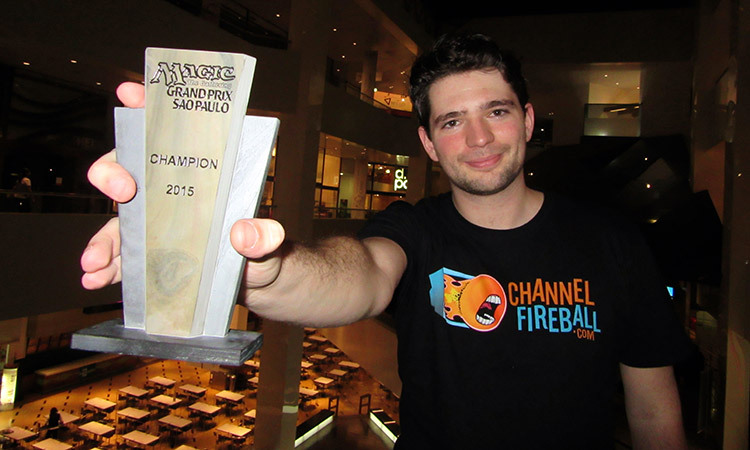 Modern, Standard, and Limited are the formats he plays the most. Of the three, he is most drawn to Modern due to the diversity of decks. His second-favorite of the three is Limited; "Ever since I got a Magic Online account, I've been playing more Limited, mostly due to the 8-4 queues that fire any time of day. I like the draft process and evaluating cards in a vacuum, as well as in relation to the cards I've already picked." Kulik wrote about the Modern format in his essay for the Gamers Helping Gamers application. Specifically he wrote about two cards—Cryptic Command and Tarmogoyf—and how they are often at odds with each other in a variety of white-blue-X decks vs. a swath of black-green-X decks. It should not be a surprise which side of that battle he liked to be on. "I am a blue mage and I like to have options. Cryptic Command does everything you would want from a card in a blue deck," he said. "It is the definition of flexible, it can switch gears from being a defensive card to an offensive card, or just simply gets rid of the opponent's trump card. As a blue mage, creatures are always something to fear, especially ones that are extremely undercosted for their power level. Tarmogoyf is almost the sole reason I would play Spell Snare main-deck, to respect the possibility of my opponent's turn-two Goyf on the play." Kulik already has one year of college under his belt, but it came at great financial cost to him and his family. Due to his residency status in this country, he was not eligible for any type of financial aid. Nor could he secure a loan that was feasible for him to pay back. He had to drop out of the school he was attending and come up with a new plan. "This scholarship is honestly a lifesaver," said Kulik, whose back-up plan for paying off his tuition was winning a Pro Tour. "After a year off, I decided that I just have to go back to school no matter what. I got into the City College of New York at Baruch, which has a much lower tuition cost than my previous school. My job can cover the cost of living in the city, but not much beyond that. So the burden would once again have to be on my parents. This scholarship seemed like a way out of this scenario, so I put a lot of effort into it. And it ended up paying off greatly. I will be able to pay for the remainder of the school tuition myself." 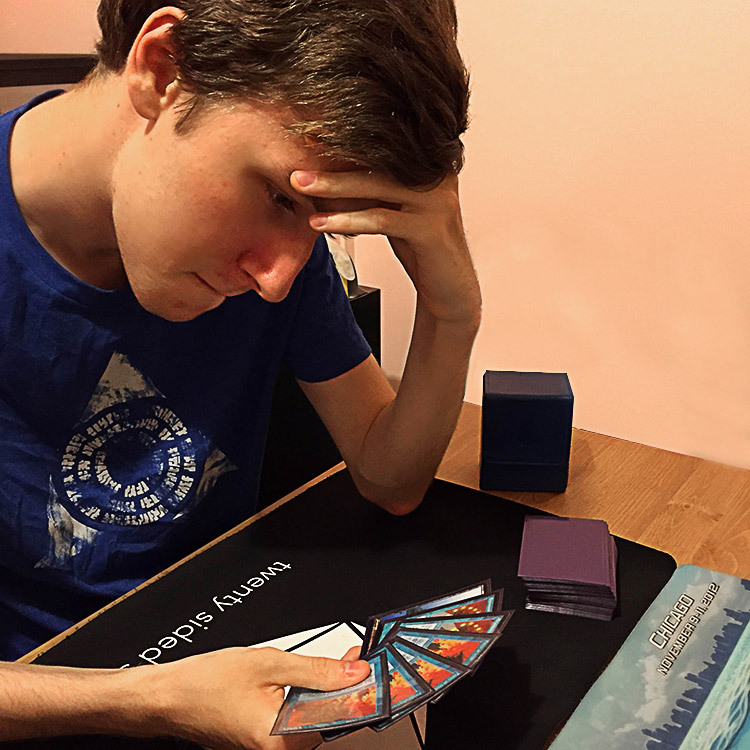 Kulik plans to sneak in some Modern Masters drafts and maybe a Standard Daily or two in on Magic Online around his hectic work schedule as a tutor, but is looking forward to attending Grand Prix Providence. "I have been preparing for it for a while now with Esper Dragons, and I am constantly amazed at Paulo Vitor Damo Da Rosa's ability to consistently finish in the Top 8 at huge tournaments with the deck. It goes to show that, if played correctly, the deck has amazing potential. I have two byes at the tournament, thanks to my nice collection of Planeswalker Points, so hopefully I will at least make Day Two of that tournament." 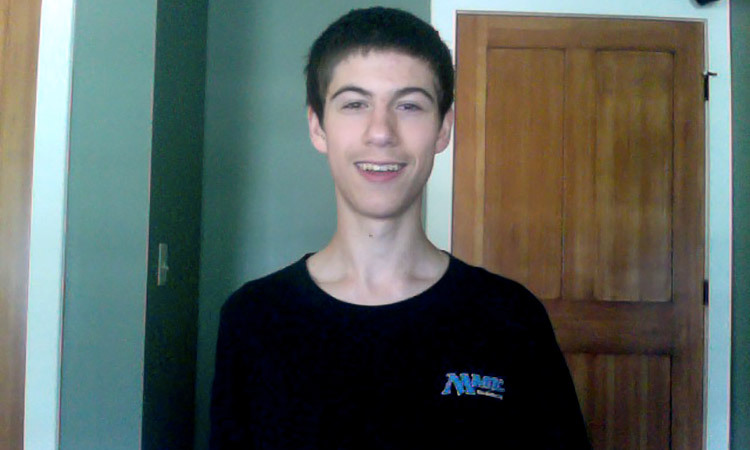 Dylan Quinn is the other winner of a Gamers Helping Gamers scholarship this year, and the seventeen-year old hails from Cheshire, MA, where he has been largely a casual but passionate Magic player since his brother and a friend gave him a Fat Pack for Christmas. He was immediately smitten with the variety of cards and all the interactions. His love for the game has only deepened over the years. Dylan Quinn, one of this year's Gamers Helping Gamers scholarship winners. "I usually play Commander with friends or attend local FNMs," said Quinn, who shares a love of certain color with his fellow scholarship winner from this year. "One of my favorite decks has been based around Sen Triplets. The deck had a good number of artifacts and had an overall controlling theme, with removal, counterspells, and Wraths. My current Commander deck is based around Teferi, Temporal Archmage. My friend gave me the Teferi Commander deck last Christmas. I loved his abilities, so since then I have just replaced a lot of the cards in it. Mono-Blue is always an all-around fun deck to play. My Teferi deck is my go-to deck for the format." It should not be shocking that someone who plays Mono-Blue in Commander is testing the waters of more competitive Magic. "I have only been to one Grand Prix, however I am looking forward to attending more, and potentially branching out into the more competitive Magic scene. My favorite format is Draft, because each time I draft, my deck is different. I specifically enjoy trying to go 'big' in the format—maybe playing some 5-color deck or pulling off weird decks. My favorite format was Return to Ravnica Block Draft, because I could always force 5-color with all of the mana fixing," said Quinn, who fittingly listed Luis Scott-Vargas as his favorite Magic player. As Quinn was finishing up high school, his advisor encouraged the class to look for scholarships that pertained to areas of personal interest. He Googled "Magic: The Gathering scholarship" and quickly found himself immersed in the application process for Gamers Helping Gamers. "This was definitely the most enjoyable scholarship application I have completed, because it is on a topic of great personal interest," said Quinn who wrote about the first time he won a Draft as part of the application. He also wrote about his favorite card. "I played four copies of Goblin Grenade a few years ago in a Standard Goblin deck. Goblin Grenade was almost never dead in my hand, and I would often kill my opponent with it in conjunction with Reverberate. Goblin Grenade required support from other cards and, with them, could be very potent. I understood how Goblin Grenade and my deck as a whole wanted to function, and because of this I performed well at local Standard tournaments I attended. Although my deck was not 'top tier,' I had created the deck and so I knew all of the ins and outs to it," explained Quinn who had a specific affinity for the M12 version of the card. "Another aspect I love about Magic is the flavor behind cards. The text and art of Goblin Grenade embody this for me by creating a very humorous flavor." "I am proud to have received this scholarship because, by pursuing this passion of Magic for such a long time, I will actually reduce my cost of attending college. All those packs and drafts paid off!" exclaimed Quinn, who is looking forward to making new friends through the game as he enters the next stage of his life, at college. "I am planning on attending a least a couple of local FNMs this summer. I am also excited to join the Trading Card Game club in college and become part of a new Magic community!" Thirteen different people won major Magic events in the month of May between the Magic Online Championship, four Modern Masters Grand Prix on one weekend, five more individual Grand Prix and one Team Grand Prix. It would seem hard to put any daylight between the contenders, but in the end it was the Brazilian Pro Tour Hall of Famer's return to dominance that earns him the award for the month of May. Hall of Fame Pro Paulo Vitor Damo da Rosa, May Magic Player of the Month. Damo da Rosa has always been the model of consistency at the game's highest levels. Even before he broke out with his first Pro Tour Top 8 finishes, he was regularly making deep cash runs into Day Two of the Pro Tour. Once he cracked the code for finishing in the Top 8, he did it more often than any of his contemporaries, and he is tied with Gabriel Nassif for the third most Top 8s of all time. Only Kai Budde and Jon Finkel have more. That is why it was something of a shock over the past two seasons to see Brazil's superstar fall back in the quest to lead the National team at the World Magic Cup. But ever since Pro Tour Dragons of Tarkir, Damo da Rosa appears to be back and as strong as ever. His current hot streak, which reaches back into April and has extended into June, has been at the reins of the powerful Esper Dragons decklist that he piloted to a hometown victory at Grand Prix São Paulo. That victory gave him the Pro Point boost to leapfrog the players ahead of him in the race to be the National Champion from Brazil. It has him occupying one of the regional berths at the World Championship (if the season ended today), and now has earned him the title of Magic Player of the Month for May.